Malignant tumors of the external ear are rare, most of these tumors develop in the skin of the outer ear. It is commoner in fair people, especially those who are exposed to sun rays for long times, it occurs in the outer surface of the ear pinna. It starts as an itchy painless nodule which ulcerates later on. The ulcer has an inverted beaded edge, with necrotic floor and a hard base. No lymph nodes are detected except in case of secondaary infection, or transformation to squamous cell carcinoma. Wide local excision with safety margin using Moh's technique (microscopically histopathologically- guided surrgery). It may occur in the auricle (60%) or in the external auditor canal (30%) or as an invasion from the middle ear (10%). 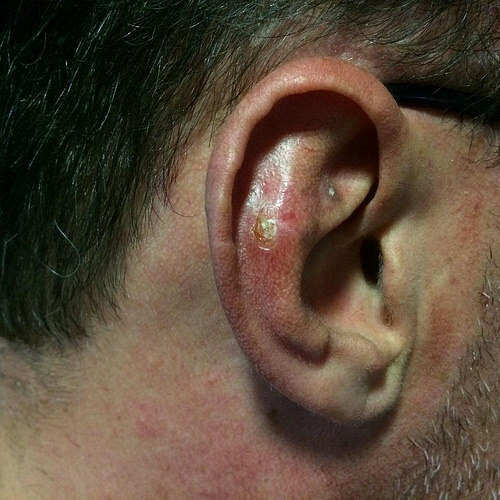 Stage I: Mass or ulcer in the auricle or external auditory canal skin without involvement of bone. Stage II: Involvement of the bony canal. Stage III: Involvement of the middle ear or mastoid, the patient starts to complain of facial paralysis. Signs: Enlargement of the pre-auricular, pre-parotid and later on upper deep cervical lymph nodes. C.T detects invasion of the bony canal, mastoid, middle ear and petrous bone. Stage I: Radical mastoidectomy with post-operative radiotherapy. Stage II: Partial temporal bone resection. Stage III: Subtotal temporal bone resection.